You might not know that I have a thing about candles. It is amazing how something so simple can make a difference to a room and also to your mood. I don't know if it's me but I think the best candle scents come out around the autumn/ winter period. Twig + Dot invited me to take part in their 12 bloggers of Christmas campaign, which I have been designated Day 12. 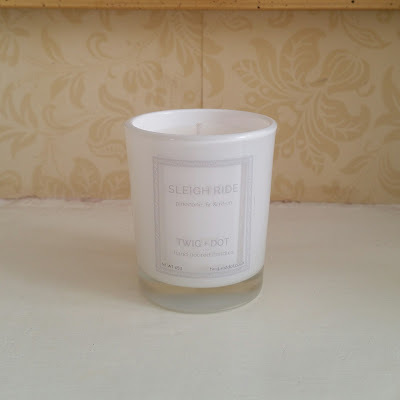 Do have a look and see what the other bloggers thought of their candles for the previous days. 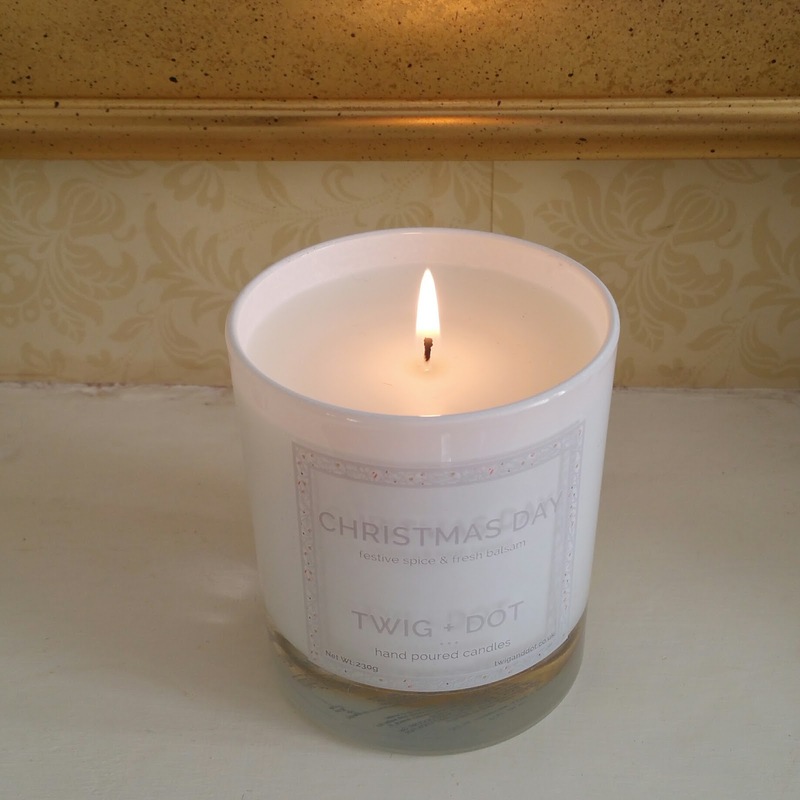 All Twig + Dot candles are made from a blend of soy and mineral wax and are hand poured in the UK. Candles come in two sizes options, a 45g mini votive which retails at £3 and burns for approximately 5 - 8 hours. Normally votive size candles are usually wrapped in plastic, so it was a nice touch that it came in simple glass jar, perfect for a last minute stocking filler. The large 230g jar which costs £16 and burns for approximately 30 - 40 hours and comes with a stylish silver lid and can be placed in any room setting. Christmas Day is such a beautiful scent, of cinnamon and vanilla and definitely reminds me of Christmas day. the scent was nice and subtle which lasted even after the candle was blown out. Sleigh Ride reminded me of the outdoors, green and fresh and was a nice clean scent. Both candles had a lovely natural scent and there were no chemical after scent which some other brands have. Remember to never leave a candle burning unattended!! Have you tried a candle from Twig + Dot? What is your favourite Christmas scent? I'm wanting some lovely candles for Christmas. These look lovely and scented ones are always more relaxing too and they affect more than one of the senses. These look gorgeous. I hoard scented candles, they're almost too lovely to burn sometimes and the sleigh ride scent sounds really unusual. I am not familiar with the brand but I do love all vanilla scented candles. 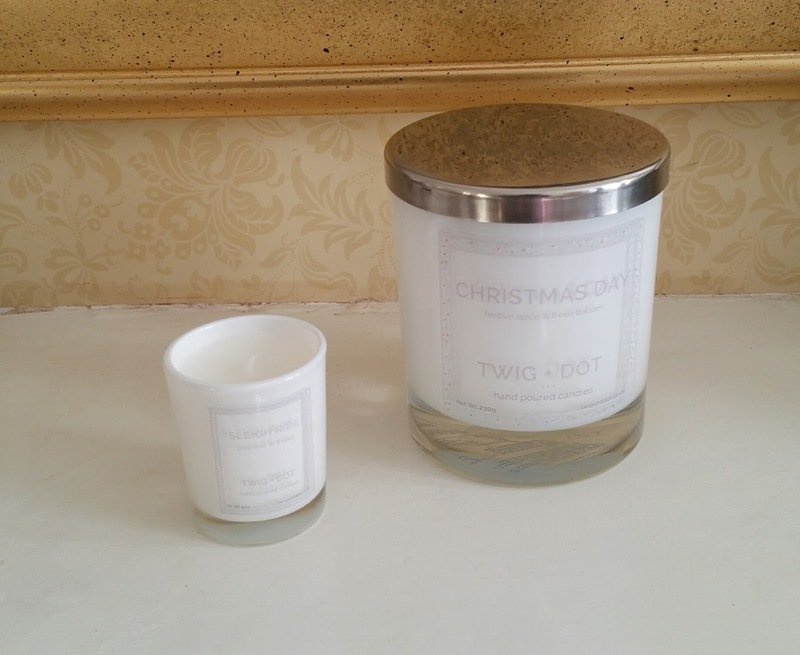 I have never heard of Twig and Dot before but if they are anything like Yankee Candles then I am hooked. Will do some research. I have never heard of Twig and Dot until I read your blog. They look and sound gorgeous. I would love both of those scents. I always have a candle burning at home to create a beautiful scent in my home. New blog design & Giveaway! !